How Often Should I Lift Weights per Week? Lifting weights can do more for you than just attract attention on the beach or make you the envy of your friends. A toned and lean physique may be desirable, but regular resistance training can also help lower the risk of heart disease, decrease blood pressure, and improve cholesterol levels. However, too much weight training every week can sometimes do more harm than good. If you’re experienced in weight training, try a split routine to give you a total resistance workout of three times per week. Space out your weight training by lifting weights on one day and resting the next, as this ensures that your muscles get a good chance to recover. For example, lift weights on Monday, Wednesday and Friday, perform some moderate cardio exercise on Tuesday and Thursday, and take the weekend to completely rest your entire body to be ready for the next weekly routine. The American College of Sports Medicine recommends two to four sets of resistance training on each major body part (arms, legs, chest, shoulders). If you're under the age of 40, each set should contain eight to 12 repetitions with a weight that you can manage before it becomes a struggle to lift. 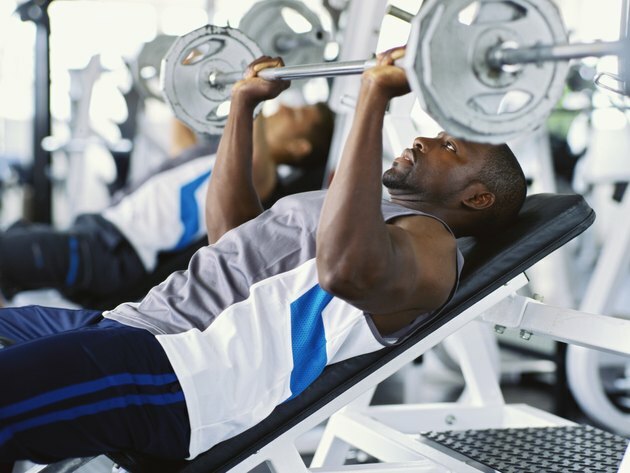 For people over the age of 40, aim for 10 to 15 repetitions per set. This increase in reps is required because muscle mass is lost naturally as you age, and you will need to work harder to maintain and build muscle the older you become. You should rest and allow your muscles to recover for at least 48 hours after your resistance training session before you tackle your next one to ensure that your muscles have time to repair. The Centers for Disease Control and Prevention states that resistance training for increased strength can reduce the symptoms of arthritis, osteoporosis and diabetes. Strength training can also increase bone density, metabolic rate to aid weight loss (thanks to an increase in energy consumption) and help you maintain a strong heart and overall cardiovascular system. On the other hand, overtraining (lifting weights too often with little if any rest between sessions) can lead to damage of skeletal muscle and delayed onset muscle soreness. Always consult your doctor before embarking on any resistance-training exercise program. Seek medical advice if you're pregnant or have a history of heart disease. Always seek the advice of a qualified professional with regard to proper form and lifting of weights or operation of resistance-training machines. How Many Body Parts Should I Workout a Day?